A professional spokesman with consistent fishing tournament performance, expertise in conducting sport show seminars and considerable experience in outdoor writing and promotion. 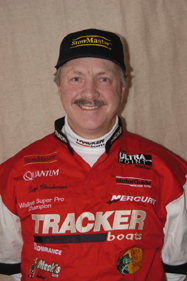 Successes include: 2003 PWT Lake Erie Champion; 1998 Super Pro Champion; 18-time national Walleye championship qualifier; 37 top-ten finishes in walleye and bass tournaments, including eight firsts and nine seconds, in PWT and other tournaments fished, including the North American Walleye Anglers Quest, Mariner Walleye Classic (1988 Champion), Old Style National Walleye Tournament (1988 Champion) and Wisconsin Bass Fisherman’s Association Tournament (1986 State Champion). Awards include: Cool Under Pressure Award and the Live Release Award-1998 PWT Super Pro Tournament, In-Fisherman Sharp Angler Award-1994 PWT Championship, Master Walleye Circuit’s “Mr. Consistency” Award for scoring qualifying points in 40 consecutive tournaments, State of Wisconsin Outdoor Responsibility Award and several additional angling awards in Canada and the United States. Daryl has delivered presentations to tens of thousands of anglers in over 100 cities in 20 states and two Canadian provinces on bass, northern pike, muskie and walleye fishing covering fish location, important timetables, effective lure presentation and proper equipment with full-color professional slides and distribution of catalogs and/or samples to enhance product endorsement. Daryl has been spotlighted on national, regional, state and local television, radio and program appearances, including TNN, ESPN and ESPN2, on shows with over 200 million viewers such as In-Fisherman, Discover Wisconsin and many others. Daryl has published over 1500 photographs and freelance articles on outdoors and fishing in various publications including: Fishing Smart, Gone Fishin’, In-Fisherman, Badger Sportsman, Michigan Fisherman, Muskie Magazine, Ohio’s Outdoor Beacon, Ontario Outdoors, Outdoor Life, Outdoor Notebook, Sportsman’s Press, Sports Afield, Walleye Magazine, Walleye Insider, Wisconsin Sportsman, Woods & Waters and Wisconsin Outdoor Journal. Daryl has authored the following books: Journal of a Walleye Pro, Walleye Jigging Tips, Fishin’ with a Mission, Fishing the Wisconsin Largemouth Bass, and Your Complete Guide to Montello and Buffalo Lake Fishing. Daryl was featured as the exclusive angler in Jigging Walleyes A to Z in the Masters of Walleye video series and featured in Walleye Tactics, Tips and Tales, a book by the North American Fishing Club. Sponsored by: Tracker Boats, Mercury motors, Quantum/Zebco, MotorGuide, Bait Rigs tackle, Lowrance Electronics, StowMaster Nets, Mustad hooks, E-cell, and Black Mountain Outlast Sportswear. Member of: Tracker Marine National Fishing Team, PWT Advisory Council, MWC Rules & Ethics Committee (1991-1994, 1996-1999), National Professional Anglers Association (NPAA, Charter Member), Walleyes for Tomorrow. Married, with five grown children; enjoy birdwatching, photography, hunting and church activities during breaks from fishing tournaments and sport shows.